January | 2015 | ohdenny. 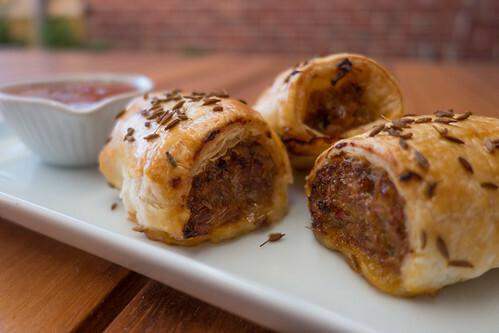 I’ve always liked a sausage roll that varies slightly from the norm. 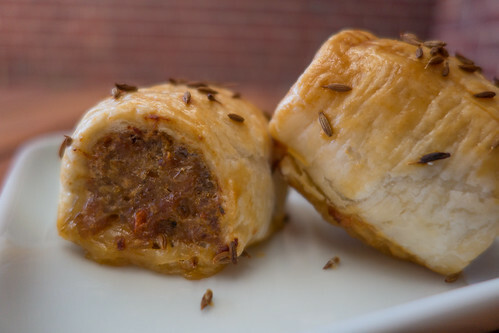 I grew up with Four and Twenty Sausage rolls at school but to be honest it was never a favourite. The Aussie Meat Pie came out on top each time. 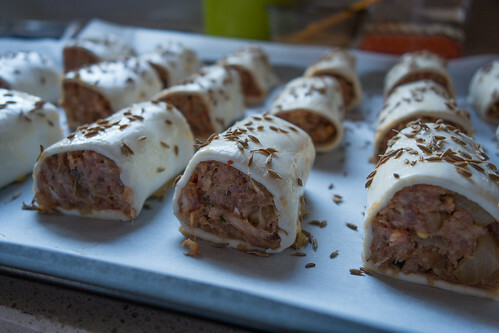 However, sausage rolls are great for picnics or finger food parties so I found this recipe on the Jamie Oliver website. Recipe is by Peter Begg, it creates an interesting combination of chilli and paprika. I made some additions to the recipe to give it a bit of sweetness and also if you cannot find pork sausage meat or it may be out of your price range it can be substituted with pork mince and a few other ingredients as noted below. Check out the recipe below! 2. Pierce the chillies then toast over a gas flame or a hot grill until black and blistered. Place in a bowl, cover with clingfilm and leave to cool. 3. When cool enough to handle, pull off and discard the skins then scoop out the seeds – or leave in if you want fireworks! Chop the chilli flesh and set aside. 4. Mix with the sausage, paprika, chives, sweet chilli sauce add in the chilli flesh or chilli flakes and add a pinch of pepper. 5. Sprinkle a work surface with flour. Cut the pastry in half and roll out into 2 strips, 50cm x 15cm each. 6. 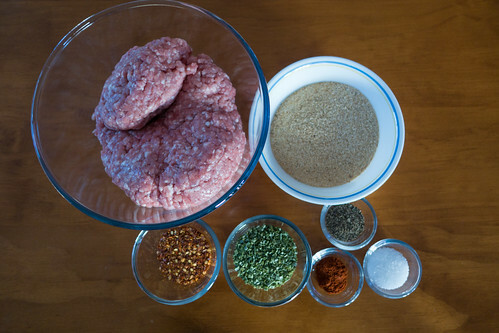 Shape the sausage meat into 2 sausage shapes and place along the middle of each strip. 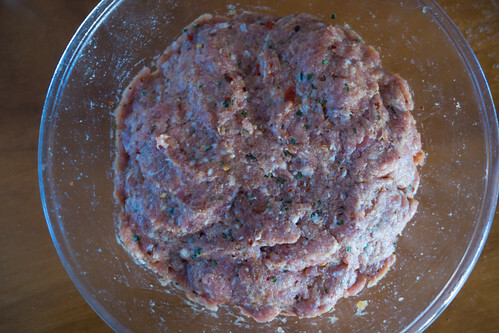 Coat the pastry either side of the sausage with the egg mixture. Fold the pastry over and press down to seal. 7. 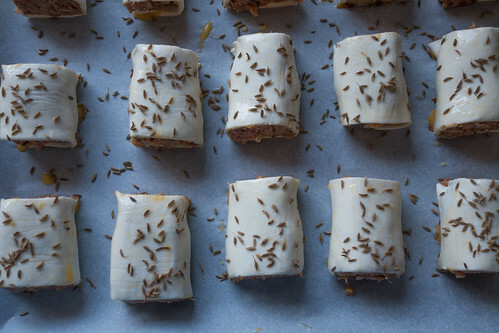 Brush the tops of the sausage rolls with egg wash, sprinkle with cumin seeds and sea salt (Sprinkle less on top for a more subtle cumin taste). Cut into 5cm lengths and place on a non-stick baking sheet. 8. Bake for 20 minutes, until risen, puffed and golden brown. Tom Toon Thai Noodle Cafe is one of the now many Thai restaurants in Richmond, located just doors away from Ying Thai and walking distance from Jinda Thai, Jaidee Thai and iSpicy 2. You’re spoilt for choice in this particular part of town. Tom Toon isn’t a large restaurant, but it does have this unique character about it. 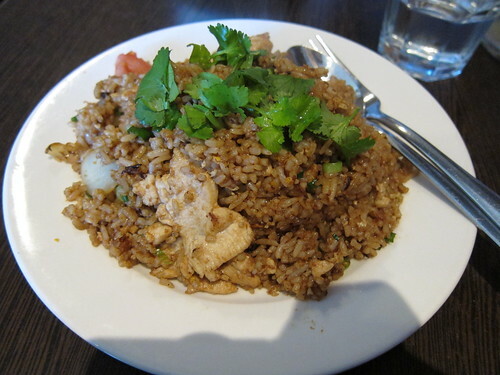 I always seem to lean towards the Thai Fried Rice and here flavour-wise it’s fantastic. Delicious, but just as a personal preference I prefer Fried Rice to be drier, but I’ve noticed that most Thai Fried Rice’s are like this as compared with the Chinese or Malaysian Fried Rice. My favourite is still Jinda Thai, but the rest of the bunch aren’t too far behind in quality. 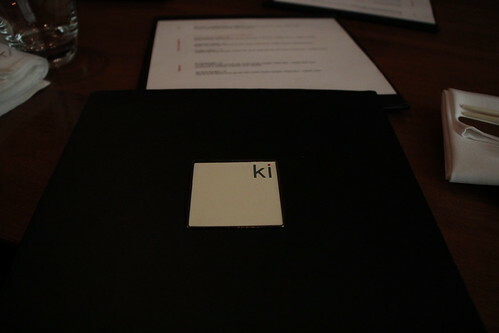 Ending my Toronto series with Ki Modern Japanese and Bar located on Brookfield Place Bay Street, in the Toronto CBD. 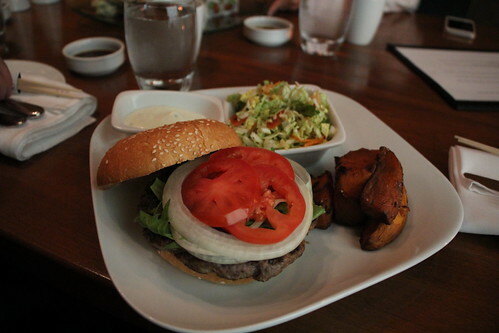 Ki meshes the Western culture with Japanese cuisine in which you end up with dishes such as burgers but with a slight twist or sushi with spicy tomato salsa or mango. For those looking for a more traditional Japanese meal, at Ki they do offer a variety of freshly made nigiri, sashimi and maki sushi rolls. As a modern Japanese restaurant, they also serve slightly different sushi rolls, some with bacon or sweet potato which make for interesting combinations and especially on your palette. Overall, the food quality here is fantastic. 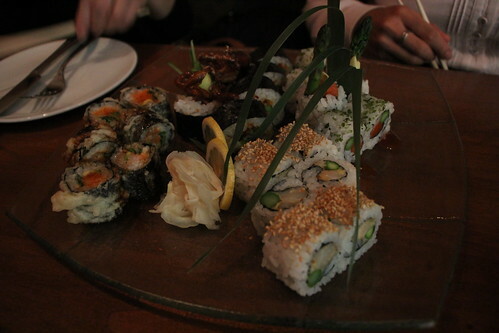 The sushi, tempura sushi and even the burgers are all delicious. However, I found the dishes leaning more towards Western style to have very minimal Japanese influences as such it would appear like eating it in any other upmarket cafe or the like. Ki do Japanese well, although it comes at a price because the dishes here aren’t exactly cheap. Marche de la Villette was recommended by my sister because of their soupe à l’oignon (aka French Onion Soup) so we had to give it a try. 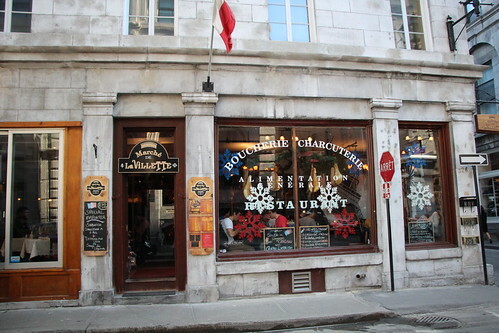 Located in Old Montreal, this eatery is super popular. We travelled down to Old Montreal twice on our visit and even in the late afternoon, there was not a spare seat in sight. Having a little patience, we found a table. 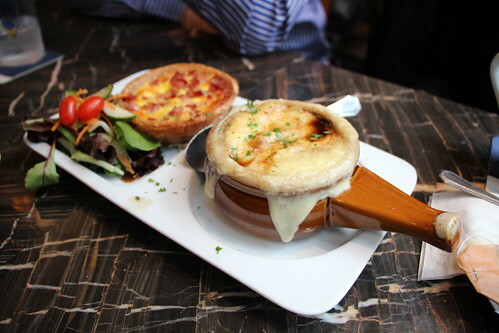 Their French Onion Soup comes in this cute bowl, with the cheese oozing on the sides. The soup itself is rich and creamy, and very flavourful. I’m not fond of very creamy soups but sharing amongst the three of us it was just enough to go around. We also ordered the Quiche Lorraine, the pastry is nice (although harder than I’m used to) but the filling was moist. 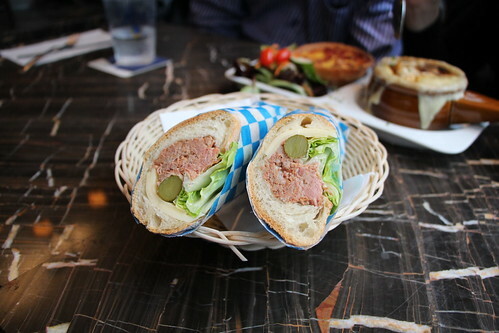 Keeping it a bit light, we also ordered Pate Sandwich, being in Montreal and all I had to order it. Coming in a baguette roll, the pate was delicious although I’d prefer if the bread was warm or toasted as it was a chilly day on our visit. 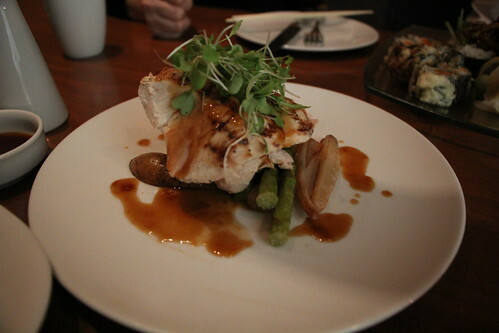 To be honest, it wasn’t amazing but above average I would say but it definitely a lovely dining experience in Old Montreal. 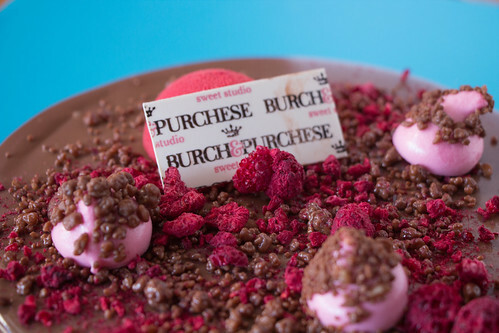 Burch and Purchese had been high on my to do list (or to taste list) for quite sometime. Darren Purchese had previously been featured in Masterchef Australia and B&P’s dessert combinations are one of most enticing and creative desserts in Australia. Finally I found time to travel to South Yarra to take a look-see, and was surprised at how close it was (near the Como Building) and was so closeby to my old high school. butter mousse and raspberry jelly. Raspberry and peanuts isn’t a combination I’ve tried before, and let me tell you it’s amazing. I love the nuttiness, with the tart raspberries and that rich and delectable salted caramel. Yum! This dessert also comes in a cake which will be my next purchese purchase. 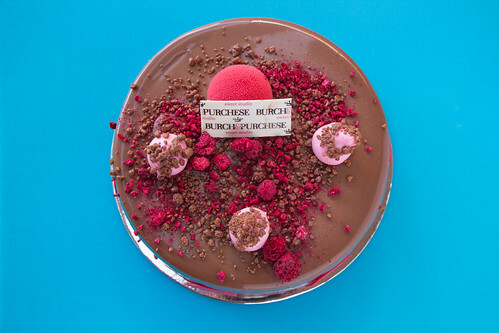 B&P’s Explosive Raspberry Milk Chocolate cake is one of their more popular desserts, and who wouldn’t love popping candies in a dessert. It’s like being a kid all over again. 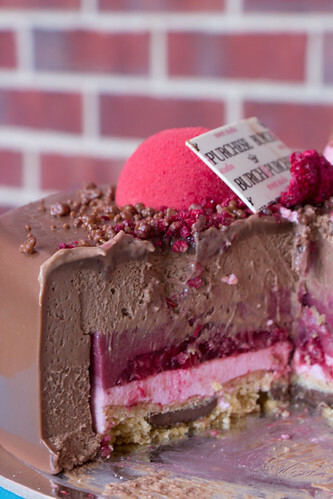 Layered with raspberry cream, raspberry marshmallows, raspberry compote, choc chip cookie crumb base, raspberry & milk chocolate mousse and chocolate popping candy. It has become one of my favourites. 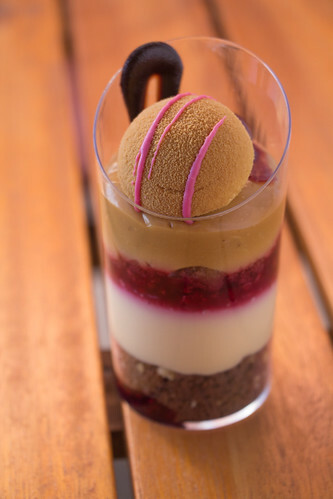 That choc chip cookie crumb base is incredibly delicious and again the light chocolate mousse with the tart raspberry flavour works well together and then you get this little popping on your tongue. Memorable for sure. Now I see why B&P is held in such high regard. You can also definitely see the amount of work that goes into making one of these desserts with so many layers and I would assume a plentiful of processes before it’s complete. B&P was well worth the trip down, and my only regret was not trying it sooner!